Adele Patrick: Hello. Thanks. Nice to see everybody. Can I just preface this little presentation with an apology for its banality. I had a little note through from Reiko saying, ‘assume that people know nothing, at all about the territory of issues that we are going to cover’. So – I look around the room, and I see people who know so much about this territory – so, my apologies. My name is Adele Patrick. I am a co-founder and currently Creative Development in Lifelong Learning Manager at Glasgow Women’s Library. The library evolved from the grass roots. It grew from a group that galvanised around the announcement that Glasgow was going to be European City of Culture in 1990 and, after programming a really quite ambitious series of events that showcased women’s creative work during this year-long festival, a momentum was created that culminated in the milestone launch of the Women’s Library in 1991. From an entirely voluntary project, the library now has many facets. It has become an information hub for, and about, women in Scotland. It has a collection of over 20,000 volumes of material. We have got art works and ephemera – masses and masses of stuff. Significantly, all the material is donated. We have now got project workers and staff including a Black and Minority Ethnic Development Worker, Adult Literacy and Numeracy Project Workers and other staff. This is a problematic area that the Core Group have been looking at: the notion of the apparent, inevitable, ossification that takes place when a project becomes an institution or a component of a cultural quarter. 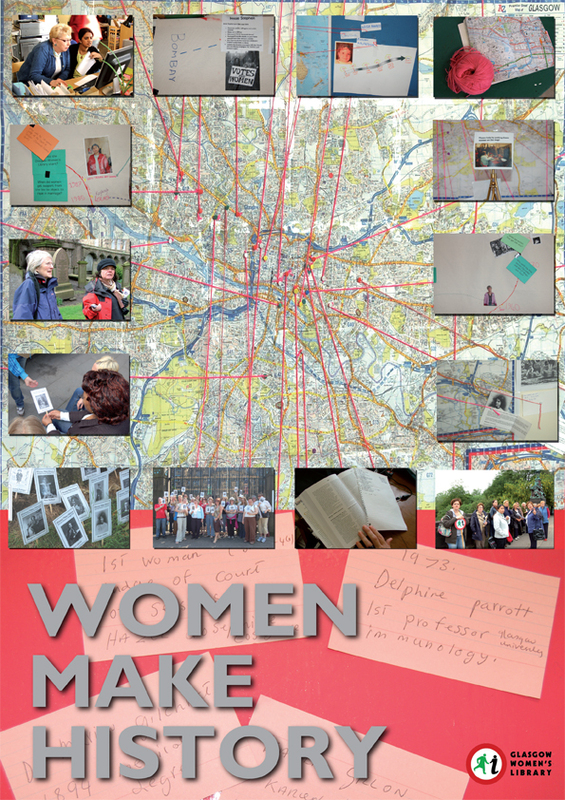 The project I have chosen to speak a little about this evening to illustrate the work of Glasgow Women’s Library, and our work in public in particular, is the ‘Women Make History’ Project. This project that has been developing over the last year and reflects the cultural, ethical and artistic set of aims of the organisation as a whole. It has been developed by an engagement of genuinely diverse group of women. I think over seventy have been involved so far and, unusually, includes academics, women who had experience of poverty and homelessness, women who are adult-learners, women artists and writers – so there is a genuine hybridity of ownership and participation. The aims of the Women Make History Project, and of the Women’s Library more broadly, is to unearth, celebrate and promote through accessible, visual and creative methods women’s diverse histories, cultures and achievements. In Year1 of Women Make History – this past year – women were involved in the group’s development in planning research, workshops, skill-sharing and participated in activities including a programme of activities entitled ‘Making and Doing Women’s History’ that connected women who were beginners to research and to ‘history’ itself with resources and skills including archives, object-handling, looking at existing history tours and tour-guiding skills who were introduced to museums and curators and to an array of research methods. One really successful outcome has been the development of a Women’s Heritage Walking Tour in the West End of the City and this has been delivered several times during the summer and now the tour guides who developed this programme are paid . The next tour is going to be in the East End. One artistic goal is to commission work in public that makes tangible records of women’s issues in Glasgow. There is currently, as many people are aware, only three public sculptures of women in the City. Only one Glaswegian. I think there is scope for artists to work with women in creating a piece outside the physical site of the future Women’s Library in, and outside, the Mitchell Library, our new home from next year. The work of Women Make History is to help augment and mobilise a broader critical mass and support required for the Women’s Library’s bid for national status. This is a significant construction of a diverse new public that owns the vision of, and desires to have, a new institution in Scotland which, as I say, is both exciting and problematic. We are currently funded by the Scottish Government to scope this and we are also looking to gain Museum Status to become a Collection of National Significance. The Working in Public Seminars have provided a unique and meaningful opportunity at this critical stage in our own organisation’s development to examine the spectrum of making work with and constructing publics. From the inspiring model of the Oaklands Projects that, in itself, forged connections between art, media, literacy, strategies of advocacy, mentoring, to enable social change through to the quite cautionary models that we heard about of from Francis McKee and Tom Trevor of the entropy (that I mentioned earlier on), where institutions might become disengaged, where they fail to reflect their publics. Women Make History at Glasgow Women’s Library (and the future Women’s Library of Scotland) is constructing a much-needed vision to illuminate territories of history, of Scottishness and gender and is using the power of the arts to involve and articulate a specific spectrum of voices and histories and so on in, what is arguably, still quite a hidden aspect of our national culture.